This is a regular feature at Faith and Family Live. It’s just a tidbit, but is a nice weekly article. Of course, today’s frigid temp was just a gentle reminder that we live in Michigan, so we shouldn’t get take any warm days for granted. But then the beautiful sun offered that ray of hope that comes with this time of year. I love how the little bits of green start to pop up under brown lawns. Buds almost magically appear on barren trees. And then, voila, the world as we know it, has changed. It’s so appropriate that Easter falls in spring. Yeah, yeah, I know in other parts of the world, it’s still Easter and the weather won’t match my analogy. But I don’t live anywhere but here. In Michigan, spring is flirting with us. Offering us a reminder of the promise of something better. Just like Easter. So consider Good Friday winter and Easter spring. Without one, there wouldn’t be the other. A fact we need to be reminded of year after year. (Or day after day!) And we shouldn’t take either for granted. Lillian: I’m going swimming in a princess lake with whales that wear crowns and dolphins with no teeth. Henry (eager to join in on the fantasy): Can I come swimming with you? Lillian: Yes. But your lake has sharks. 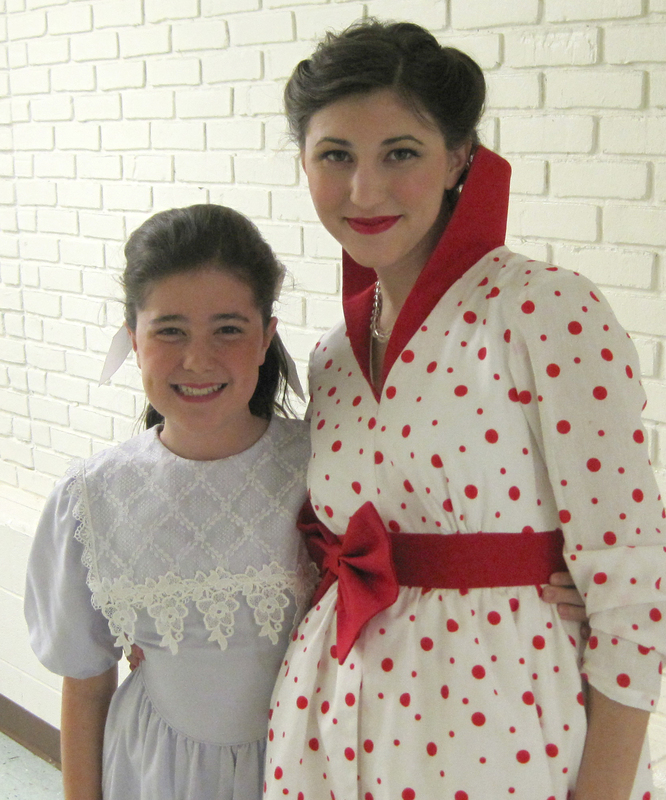 I had the great fortune of being backstage with Helen and Mary Claire during last night’s performance of the Music Man. It was fun watching the scramble as all the kids changed costumes and waited for cues. Slipping in tap shoes, adjusting glue-on mustaches, reapplying lipstick. What I’ll treasure most is the mere fact that Helen and MC got to do the show together. Almost five years apart in age, these opportunities don’t often present themselves. Mary Claire’s excitement throughout the week was palpable. She was counting down the days. She enjoyed watching the backstage and onstage snafus get worked out with each practice. I’ve loved her daily run-down for me of technical issues and costume and hair worries. She couldn’t wait for me to see her sweet costumes and kept asking Helen if she was delivering her lines clearly and in character. Helen had a few other challenges. She had to pull a Milli Vanilli and sing for the Marion Paroo character backstage during the dress rehearsal (with audience) because the dear girl playing the part was sans voice due to strain. She had to do that and still come onstage as her own kooky character as the mayor’s wife. The extra day of rest paid off for Marion, because she sounded just lovely last night. It was a great experience for Helen who got a first-hand taste of that ever-famous saying: the show must go on. It was especially fun watching Helen in a comic role, because quite frankly — she’s a hoot. She reminded me (and many others — based on comments) of me. A nice compliment. It’s hard for me to believe this is Helen’s last big high school show. It’s time to move on. Which is all good. She’s made her college decisions and is ready for the next set of challenges that lie ahead. I can only wonder what’s in store for her. In a little more than a year, it’ll be Mary Claire’s turn at high school, and she, too, is already busy making her plans. And likewise, I can’t wait to see how all that unfolds. It’s times like these that make me grateful for the gift of faith. The complete realization that I really have to surrender to whatever it is God has planned for my kids. And that isn’t always easy. I recognize that believing in God’s plan doesn’t mean I don’t have to participate in this plan. Actually, it’s just the opposite. I have to do my part — with Him as the focus. There’s labor involved (a lot of labor). God says, okay, here’s faith, now do something with it. And with each child, I see that something. Differently, often surprisingly and with joy and hope for the future. Amen. Now let’s get on with the show. We are having a mission at our parish this week: Journey to Joy. It started yesterday and finishes tomorrow. What a lovely way to join together as a community in praise and song. It’s just what I needed at this very moment in time. Funny how those things work. I’m sorry that my kids and dear spouse can’t attend, but we have a very full plate this week (play dress rehearsals, opening night, etc.). I feel the refueling I’m getting is enough to help us all get through all that’s ahead. I’m so grateful for all those hardworking people who put the whole thing together. What a blessing. I’m also so thankful for such a wonderful pastor and parish community. Ah. Thank you, Jesus. Amen. Imagine this, you’re driving along you hear something that just burns you. It doesn’t matter what. It could be your child not listening to you, or something that bruises your ego, whatever. It’s just something that leads to the blood-boiling feeling. So you pull over, jump out of the car, scream, stomp your feet, throw you cell phone into traffic. The whole bit. You have a temper tantrum. Doesn’t that seem just the slightest bit appealing? At least every now and then? I watch Lillian as she navigates through the disappointments of life with her emotions right out in front. Apparently rejections like, “No, you can’t have a piece of candy now, it’s almost dinner” warrant a meltdown. So, what’s my “no” to candy? What in my existence gives me license for a bona fide fit? What’s my melting point? I have to say the answer is different every day. But I somehow manage to stay an adult and not regress to the three-year-old I imagine (and at times long) to be. To some extent, just imagining the fit was somewhat satisfying in itself. I could so clearly see myself screaming and carrying on — probably because fits are very vivid in my recent memory thanks to mothering five. Allowing myself to visualize the whole thing actually helped me, since I ended up smiling with a little silent chuckle over the ridiculousness of it all. It also lead me to reflect on all the good things. All the many blessings in my life. My own ridiculous fantasy fit helped me recognize the struggles so many others go through and put my own into perspective. Although that didn’t completely diminish my yearn for a scream fest, it helped. It also brought me to reflect about why I wanted to scream in the first place … leading me to that darn and oh-so deadly sin of pride. So I sought a solution in prayer, and found it in the place that speaks to my heart the most, the book of Psalms. LORD, my heart is not proud; nor are my eyes haughty. I do not busy myself with great matters, with things too sublime for me. Rather, I have stilled my soul, hushed it like a weaned child. Like a weaned child on its mother’s lap, so is my soul within me. Maybe next time I think of that psalm before the fit. Then again, maybe not. But at least I’ll try. This morning Richard and I watched in silent wonder as Lillian played with her menagerie of horses and pretty ponies. They traveled from her room tucked securely in her pink baby stroller. She arranged them ever-so carefully on the table in the living room. Introducing each horse by parading it past the others until it found its designated spot in her elaborate display. There was some conversation between the horses. But we couldn’t hear clearly enough to understand. We didn’t want to interrupt or be discovered. So we just observed her living in her own imaginary world. This is my view in the shower. It’s pretty much been my view for 17 years and will continue to be for another 8 or nine. And boy do I feel blessed. Richard and I attended Helen’s high school freshman orientation with a babe in arms. Lilian was just a month old. We sat there and realized that we would be attending high-school related events for the better part of the next 18 years. It made us chuckle. Little did we know then that our sentence would be extended another three years, and that just shy of 21 years from that date, we’ll be attending our dear Cliff’s graduation (God willing). I will admit, that sometimes all the baby toys and baby-related paraphernalia gets a little daunting. I counted the days for Cliff to stop enjoying his swing so I could ditch that darn thing. I’ve been in the position three times where I’ve given away most all the baby goods, only to jump for joy when I was blessed with the need to bring it all back in. As the baby approaches a year, the big things are starting to disappear: the walker, the exersaucer, the bouncy seats and jumpy things. But one thing that has not really changed in our nearly 18-years of parenting is that view in the tub. We’ve always had bath toys. That phase has never ceased between children, even with their age spread. 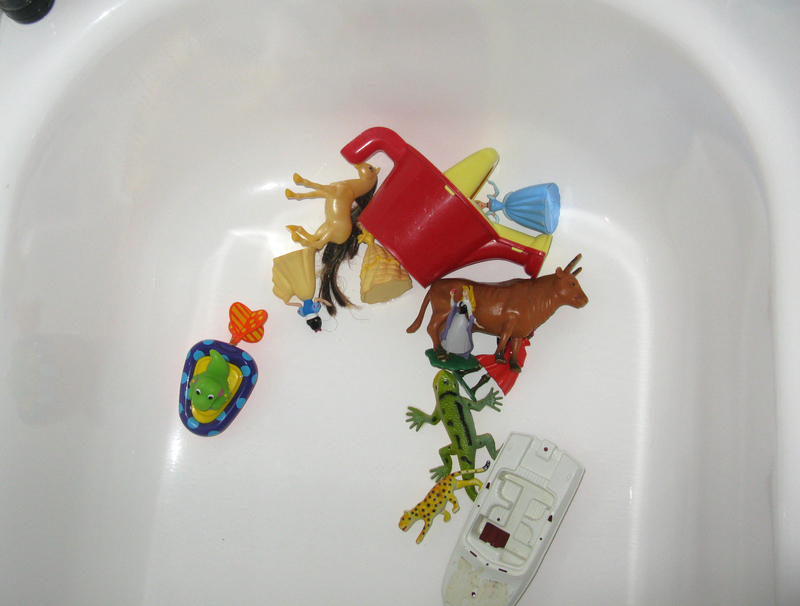 Of course, the toys aren’t always on the floor but are within reach, patiently waiting for their moment in the tub. Henry is eight, and although he frequently showers, there’s nothing like a long bath with play time. I love listening to the noises (mostly torpedoes and bombs) as the bath water becomes the sea. I know that in no time, we won’t be nagging Helen awake in the morning for school, Mary Claire won’t so willingly join in to play with Lillian, and (this is scary) Henry and Clifford will shave. As I get older, I am becoming much more aware of how quickly these years of parenting have flown. I just hope I can always remember to enjoy this view from the top.